60+ Excel tools. All in one package. Find and delete duplicate emails in Outlook automatically. The found duplicated messages can be eliminated, marked, copied or moved to any folder you choose. Search and remove duplicates in contacts, tasks, notes, journal and calendar items (but not emails) in Outlook and Microsoft Exchange Server folders. Create simple rules to automatically add BCC or CC recipients to your outgoing messages. Define conditions and exceptions to your rules if you need to send copies of particular emails. 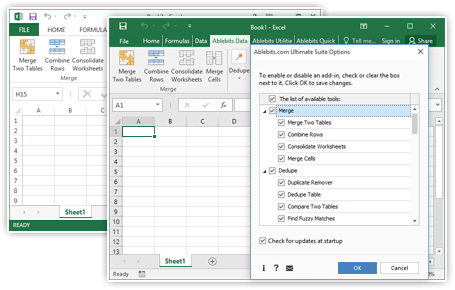 60+ Excel add-ins in one pack: easily merge and split tables, remove duplicates, find and modify data in your worksheets, and automate many other daily tasks in Excel. Find and remove duplicates or unique records from Excel worksheets. Follow 5 simple steps to compare any columns in two tables, or dedupe one list in a click. Quickly look up and copy matching data from one Excel table to another. You can use one or several columns as matching criteria, update the selected columns, and add the missing data. Merge data in the selected rows, columns, or cells using any separator you like. Be sure all data are preserved if the selection contains multiple values.